Classic insoles, Super and Sport; the only insoles with triple protection again odours. They absorb the sweat to keep feet dry and comfortable. 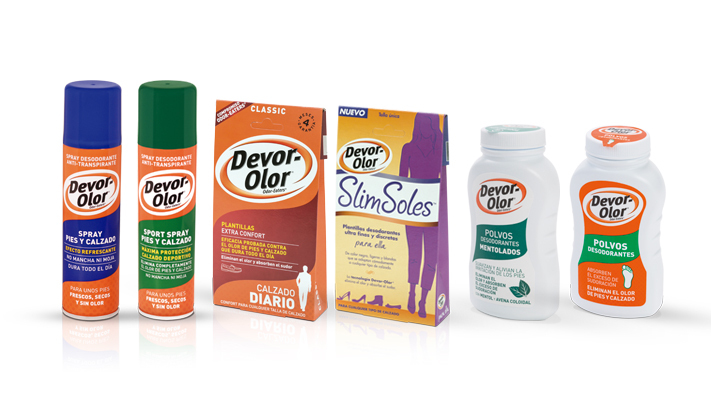 Ultra-thin insoles “Slim soles”: Deodorising insoles which are ultra-slim and discrete. Normal and Sport spray: specially formulated to combat the strongest foot and shoe odours, suitable for all the family. It can be applied directly on to the feet or into shoes. Foot Powder and Menthol Foot Powder: specially formulated with three active ingredients to give superior protection against odour and moisture. Contains menthol and colloidal oatmeal which calms and alleviates irritation in the feet caused by odour and moisture. Dry, protected feet. Take your shoes off!